The IR Remote Control Detective displaying the code for a key on a Sony remote control. 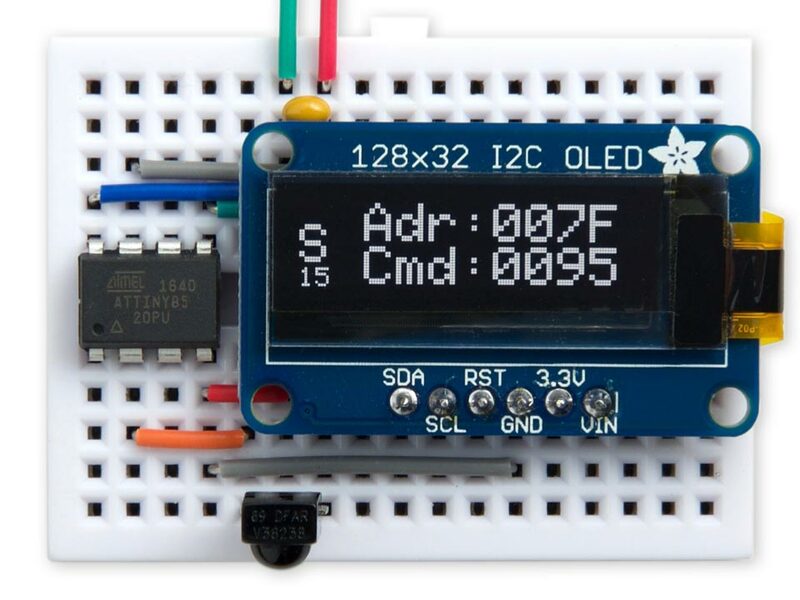 It's based on an ATtiny85, an infrared receiver, and a 128x32 I2C OLED display. I originally built it to help design a project based on an IR remote control. It will be useful if you're trying to automate the control of an existing domestic device using its infrared remote control codes, or you want to make a device you can control with an existing remote control. Once you've used the IR Remote Control Detective to find out what codes your remote control generates you could use it to control your own project using the receive routine in this program. You could also build a replacement remote control to control your equipment; for a transmit routine that caters for the same remote control protocols see IR Remote Wand. Alternatively there is a comprehensive set of routines from Ken Shirriff and Rafi Khan on their excellent Arduino IRremote site . Some of the remote controls used to test the IR Remote Control Detective. The NEC protocol was originally developed by the consumer electronics firm NEC. It is used by many Japanese and Chinese manufacturers, and by the remote controls available from Adafruit  and SparkFun . A variant of it is also used by Samsung. For a full description of this protocol see San Bergmans's excellent SB-Projects site . In the Samsung version the pulse and gap are both 5ms long. If a key is held down the code is not repeated; instead a repeat code is transmitted every 110ms consisting of a 9ms AGC pulse followed by a 2.25ms space and a 560µs burst. The Sony SIRC protocol uses a 12, 15, or 20 bit code consisting of a 7-bit command followed by 5, 8, or 13 address bits. For a full description of this protocol see San Bergmans's excellent SB-Projects site . The above example shows the command 0x2D and the address 0x1E3A. If a key is held down the code is repeated at 45ms intervals (start to start), irrespective of the number of bits in the code. The Sony remotes I've tested send at least two repeats of the code, even for a short keypress. The RC-5 protocol was originally developed by the consumer electronics firm Philips, and is widely used by other manufacturers, especially in the UK and Europe . The Address identifies the piece of equipment being controlled, and the Command indicates which key was pressed. If the same key is pressed repeatedly, the toggle bit changes for each repeat of the code. If a key is held down, that key's code is sent repeatedly, once every 114ms, without changing the toggle bit. A backwards-compatible extension to the protocol, called Extended RC-5, doubles the number of commands available by using only one start bit. The second start bit is used as a 7th command bit; its value is inverted, ensuring that the first 64 commands remain compatible with the original RC-5 protocol. The IR Remote Control Detective supports Extended RC-5. Circuit of the IR Remote Control Detective based on an ATtiny85. To decode the infrared codes I used the Vishay TSOP38238 38kHz infrared receiver available from Sparkfun , or from HobbyTronics in the UK . It has a wide enough pass band to work with the 36kHz carrier frequency used by the RC-5 protocol or the 40kHz used by the Sony protocol. Note that the infrared receiver gives an inverted output; when the carrier is present the output is low, and when there's no carrier it's high. For the display I chose the I2C 128x32 OLED display available from Adafruit  or Pimoroni in the UK . The 33kΩ resistor and 0.1µF capacitor ensure that the display is reset correctly when power is first applied, although I found I didn't need them in my prototype. The protocol is identified on the display as N for NEC, M for Samsung, R for RC-5, or S12, S15, or S20 for the three Sony variants. The display also shows the address and command as four-digit hexadecimal numbers, displayed in double-sized characters to make the display more readable; the technique is described in my earlier article Big Text for Little Display. The characters are defined by the array CharMap. To get the count we read the TCNT1 register, which gives units of 64µs. The maximum duration that we can measure is 256x64µs or 16ms, which is sufficient as the longest pulse in any of the protocols is 9ms. If more than 16ms has elapsed since the last transition the overflow flag will be set, and this indicates the start of a new code sequence. The next transition is the end of the start pulse. The length of the start pulse is used to identify the protocol: this is either 9ms for the NEC protocol, 5ms for the Samsung protocol, or 2.4ms for the Sony protocol. The RC-5 protocol is trickier because the first pulse could either be 0.889ms if the first two bits are '11', or 1.778ms if the first two bits are '10'. The variable IRtype is set to 'N', 'M', S', or 'R' accordingly. After identifying the protocol the program reads the appropriate number of bits for that protocol into the variable RecdData. The variable Bit counts which bit is being received in the code. The variable Edge is used to specify which edge we are waiting for; the other edge is ignored, and just resets the timer. When all the bits have been read the routine calls ReceivedCode() with the protocol, and the address and command bits extracted from the appropriate fields in RecdData. The NEC and Samsung protocols are the simplest. Edge is set to 0 to respond only to the falling edge of each pulse, corresponding to the end of the gap between pulses of carrier. The length of this gap determines whether the bit is a zero or a one. The Sony protocol uses the length of each pulse of carrier to distinguish between zeros and ones, so Edge is set to 1 to respond only to the rising edge of each pulse. Because the number of bits in the Sony code could be 12, 15, or 20, the routine sets up an overflow interrupt, and uses this to detect when a delay of more than 16ms has occurred after the last transition. The RC-5 protocol is the trickiest to decode as the number of transitions in a code can vary depending on the sequence of zeros and ones. Edge is toggled at each edge to respond to both falling and rising edges, and a variable Mid is used to track whether we have reached the middle of a bit. I compiled the program using Spence Konde's ATTiny Core . Choose the ATtiny25/45/85 option under the ATtinyCore heading on the Board menu. Then choose Timer 1 Clock: CPU, B.O.D. Disabled, ATtiny85, 1 MHz (internal) from the subsequent menus. Choose Burn Bootloader to set the fuses appropriately. Then upload the program using ISP (in-system programming); I used SparkFun's Tiny AVR Programmer Board; see ATtiny-Based Beginner's Kit. Here's the whole IR Remote Control Detective program: IR Remote Control Detective Program. 8th May 2018: I've updated the program to fix bugs which were giving incorrect codes for the NEC, Samsung, and Sony protocols. Thanks to Michael Bebjak for reporting the problem with NEC codes, and apologies to anyone who encountered problems with the original version. Also, corrected the declaration of the character map from uint32_t to uint8_t; thanks to Larry Bank for pointing this out. ^ Arduino IRremote on GitHub. ^ Data Formats for IR Remote Control by Vishay Semiconductors. ^ IR Receiver Diode - TSOP38238 on SparkFun. ^ Infra Red Receiver Module on HobbyTronics. ^ Monochrome 128x32 I2C OLED graphic display on Adafruit. ^ Adafruit Monochrome 128x32 OLED graphic display on Pimoroni.